Overtime or the time that an employee has worked beyond the regular 40 hour work week is a necessity in some cases and maybe a miss-management of time in others. Whatever be the case, it is highly essential that businesses are able to manage this over time in a proper way so that they can reduce any unnecessary cost and manage the bottom line more effectively. Proper planning, as well as scheduling, can help in reducing the need for any employee to work more hours than what is expected of him/her. Good overtime management will help to define as well as configure the overtime settings with a minimum and maximum overtime hours, calculation of weekly off over time as well as holiday overtime hours. It also helps the person who has the privilege to approve or disapprove the overtime to do a study of the total overtime hours done by an employee and ensure that it is in line with the rules and regulations set by the company’s handbook. 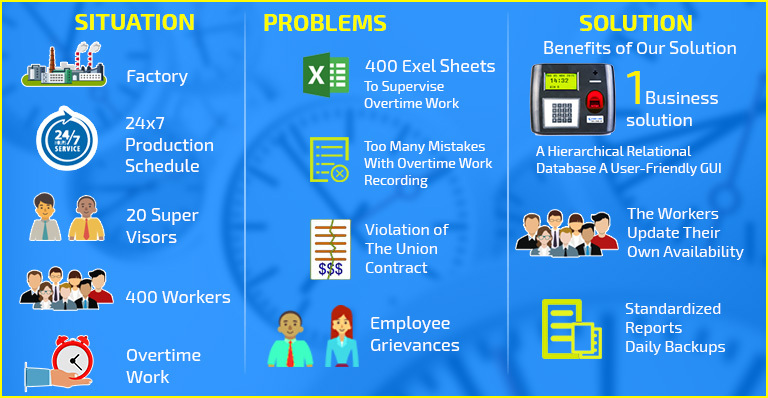 In addition to this, overtime management software can also help the company by providing a compromised overtime report that will give the complete details of work hours, weekly off hours, OT, holiday OT hours, etc. The implementation of overtime management can be done as per the location or as per the department. Overtime Management for a Particular Location: This is the type of overtime management software that you need to use if you have offices in different locations. There will one particular person in each location who are made responsible for the management of the overtime approvals in that particular location. In such cases, the overtime request of any employee working in that particular location will be sent to that respective individual and approval will be at his/her discretion. Overtime Management for a Particular Department: In this type of overtime management software, the overtime approvals are sent to the department heads irrespective of which location the employee will be working at. It is very useful in businesses which have multiple branches and are able to leverage the employees and move them to other branches as per the work requirement. Overtime Management for Location & Department: This is a combination of both the types mentioned above. When there is an overtime approval request, then it is initially sent to the Head of a particular branch and later they send it to the respective department head who can approve it based on the business need and/or requirement. One of the biggest challenges faced by small businesses is to understand why this overtime has to be done in the first place. In some cases, it comes as a necessity due to the workload being very heavy only during peak season and normal during other months of the year. In such instances, it makes sense to pay an employee for overtime rather than spending money in hiring another employee only for the peak season. In some cases, this could also be miss management of time by either the employee or the department. This can be curtailed only with the help of an effective water management software.